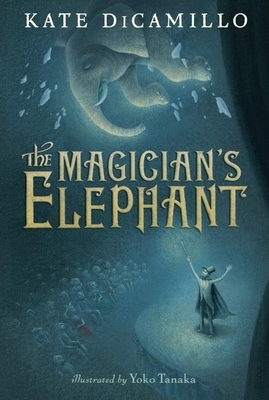 December's Children's Book Club selection was The Magician's Elephant by Kate DiCamillo. This enchanting tale tells the story of Peter Augustus Duchene, a ten-year-old orphan who lives a fairly grim existence with an ex-soldier friend of his father's who makes him practice drilling and soldiering all hours of the day and night. The young boy is resigned to his life but is always wondering about his sister Adele. Peter was led to believe that Adele died along with his mother during childbirth but he just can't quite grasp that as the truth. When a fortune-teller comes to town and promises to answer a single question for a farthing, Peter spends his supper money on finding out about Adele. The answer that the fortune-teller gives him sets in motion a series of events that changes the lives of many of those around Peter and creates the dynamic for this book. Our third and fourth grade readers really enjoyed this book. As Emma stated, "I don't read too much but I found this book really interesting. I really liked it." When asked what appealed to her, she replied "I liked the way that it was put together. And I had fun imagining how the author thought up all of these interesting situations, like the elephant falling through the ceiling!" Harry agreed, saying that the author's construction of the book was "very clever." Although Andeas thought that the book was too slow in points, his overall impression was pretty positive, as he rated it 9.5 out of 10! We had a very nice discussion about the construction of the novel itself, DiCamillo's imagination, how we would feel in similar situations that the characters were put in, and whether or not we'd change the ending. As Harry stated, "there's always something mysterious in the books we read. Mysteries make them better." By having some questions unanswered, readers are forced to think of possible outcomes or future plot points on their own. And they are more than up to the challenge! An average of five out of five stars for The Magician's Elephant! January's Children's Book Club selection is Liar, Liar: The Theory, Practice, and Destructive Properties of Deception by Gary Paulsen. I look forward to seeing you all there!